"With the 105mm and its ammunition, the capabilities are endless. As with the 90mm 7it is a creditable artillery piece. When you get a stable position, range and record all suspicious areas in daylight, and put them on your range card. This allows the interdiction of roads and trails at night. One of the standard administrative practices in these Third World brouhahas is to declare a sundown curfew, and you have almost free-fire at night. In RVN, many captured VC said that the sudden arrival of a tank shell at a stream crossing or a pass in the hills in the middle of the night had cost them many comrades. We even registered the parking slots in company base and made range cards for them. That way, any tank in for repairs need only range and traverse to one target on the card to be able to be part of the fire plan. Even a tank with its pack pulled could work the turret manually and keep that quadrant covered. What we really lacked was someone organic to the company with artillery FDC experience. If that lack is repaired by cross-training, any platoon on base camp duty can act as the resident artillery battery. The dozer tank can build you a ramp that will get the necessary elevation for long range work." Modern armored divisions can double their firepower by fielding an artillery/tank "artank" vehicle with heavy armor and the 155mm gun used by the M-109 Paladin self-propelled howitzer (above, left) or modified 120mm ammunition for use by the M-1 Abrams tank (above, right). Although a 155mm howitzer cannot match the muzzle velocity of a 120mm tank gun, its larger projectile can stop any tank. With an internal laser designator, an artank can fire laser-guided "Copperhead" munitions and score direct hits at twice the range of modern tanks. It can also devastate nearby infantrymen with ICM "bomblet" rounds, white phosphorus, or FASCAM mines. Another option is a new 155mm smooth bore gun that can fire current projectiles with the caseless fast-loading type of rounds used by the 120mm gun. However, this round may be too heavy for manual loading. 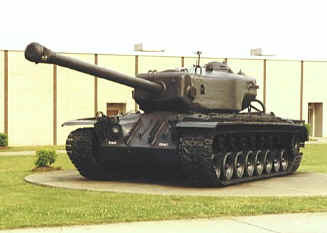 The US Army developed a T30 tank in 1947 with a 155mm gun, but it was deemed too heavy. 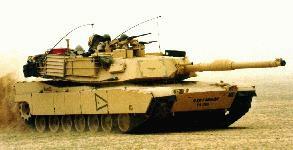 (below) The US Army did deploy the Sheridan light tank for 30 years with a 152mm gun. The German Army mounted a turreted 155mm howitzer on a Leopard tank chassis, but it lacks heavy turret armor. 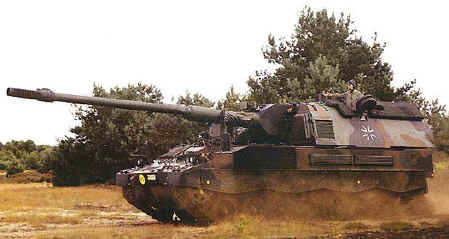 French GIAT also fielded a system like an artank, and the new German PzH 2000 looks and moves like a tank. (below) It can fire an impressive 10 rounds within one minute and at a combat weight of 55 tons, it is 15 tons lighter than an M-1 tank. Of course it has no heavy armor and cannot fire on the move. However, if it were modified with a shorter, stabilized gun to fire on the move, and a few tons of armor and larger engine were added, it would be an artank. The tactical advantages of artanks are revolutionary. Artillery will never "fail to keep up" because of coordination or communication problems since artanks can lay down their own artillery barrage. An armored battalion with artanks engaged in direct combat can call for indirect fires from nearby artank battalions. This allows an armored division the flexibility to fight as 12 multi-purpose battalions that can support each other, rather than 9 maneuver battalions supported by 3 artillery battalions. In addition, training, supply, and maintenance will be less complex with the merger of two major combat systems into artanks. Artanks are possible because "surveying" is no longer required for indirect fires. At one time, an artillery battery required some time to determine it's exact position and carefully "lay" their guns into a solid, level position. However, modern self-propelled artillery can use GPS to determine its exact position instantly, and computer software can automatically adjust for a unleveled gun. Artanks do not require the development of new technology, only the merger of direct and indirect fire controls systems into a modified turret. The first step is to modify some M-1 tanks as test beds. Is it possible to modify the 120mm gun and its turret for greater elevation? Just a few degrees adds much range. This is also advantageous for normal tank operations in urban and mountain areas. Another option to consider is to add hydro-pneumatic suspension to elevate the front of the tank instead. This technology was developed as part of the MBT-70 tank program to allow the vehicle to crouch or raise one end of the tank to better take advantage of hull-down positions. One problem with low trajectory gunfire is the dispersion is very long. On the other hand, left-right inaccuracies are less since wind is less a factor, and time to target is much faster than a howitzer or mortar. In addition, such rounds are very difficult to track by counterbattery radar. If it proves impractical to increase the elevation of the 120mm gun, it can still fire projectiles 12 miles at maximum elevation. New types of projectiles can be developed. One may have a timer that deploys petals two seconds or so after launch, like those used by bombs that open at a pre-determined time to slow the projectile rapidly, so it "stalls" and falls more downward. There is no need to mess with bag charges, just set the timer for the range desired. Those petals opening would make quite a sound the enemy learns to fear. Another option is to fire 120mm mortar rounds out of 120mm tank guns to see what kind of accuracy is possible. The diagram below shows the components of a typical 120mm tank round. A HEAT projectile even looks like a mortar round, so it seems the current 120mm combustible cartridge can be used to boost a 120mm mortar round out of a gun tube. If the explosive force from the combustible case is too powerful for a mortar round, a metal nose case is the answer. This will allow use of the large variety of 120mm mortar munitions. Since the M-1 carries just 40 rounds of ammunition, it is a good idea to develop an external ammo rack for the rear of the M-1 turret that can hold 20 or so extra rounds. If it is expected to lay down artillery fires, the external rack can be temporarily filled with high-explosive rounds provided by supply vehicles to better support that mission. Enemy artillery counterfires are less a threat to artanks since they are much better armored than self-propelled howitzers. The other requirement is to develop indirect fire control software for the 120mm gun. Even with today's tanks, crews can train as artanks with the proper software. This was already developed as part of the "Extended Range Munition", which was designed to fire a 120mm round indirectly at targets over five miles away. Tanks can extend their range by driving up an embankment in the same manner tanks have done in past wars to increase the range of their guns and fire like artillery. In odd cases where no embankments exist, engineer vehicles can quickly create some. This allows M-1 tanks to provide indirect fires at long ranges to support infantrymen in areas where terrain limits their mobility. Each tank company should include an armored vehicle that serves as a battery headquarters to aim and fire the artank's main guns, either with a direct wire link or a wireless system. Wireless is best, but a hardwire backup is desirable where a long firewire cable is connected directly to each tank's computer. The battery headquarters "master" computer can automatically determine which tank guns are loaded and ready to fire. Artank crews would require no training as their only task is to reload the gun as the turret and gun moves and fires automatically as directed by the battery headquarters computer via the data link. Yet another role for an artank is anti-aircraft artillery. Most of the needed software already exists since Navy 127mm (5-inch) guns are used in the anti-aircraft mode. Each artank battalion could have mobile anti-aircraft radar systems that can take control of tank guns via a data link to aim and fire them automatically at distant aerial targets. This would provide an impressive anti-air capability up to high altitudes with basic proximity fuzes using existing airburst rounds. This may seem unimportant today, but may be vital in the future if an enemy employs Fiber Optic Guided Bombs or EFOG Missiles. 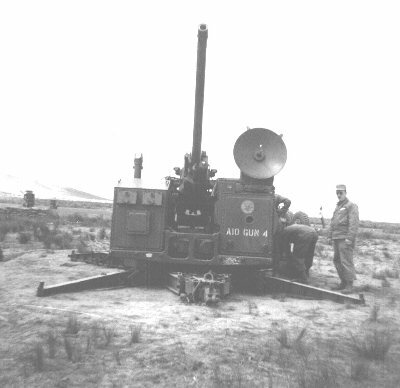 Interestingly, the US Army deployed a 120mm "Skyweeper" radar-guided anti-aircraft gun in the 1950s. (right) These could hit targets up to 80,000 feet, where large modern high-flying UAVs and bombers now prowl. This great range could make artanks effective SCUD killers and capable of gunning down large incoming rockets and EFOGMs. Artanks positioned on hillsides could hit low-flying cruise missiles aimed by any of the battalion's mobile radar systems. Once again, this requires no training for tank crews whose only task is reloading the main gun. The artank commander could take control back from a master computer at any moment if the situation warrants. Another gun option for artanks is the Navy 127mm (5-inch) gun. (left) High elevation mounts already exist, as well as basic high-explosive rounds, anti-aircraft rounds, and laser-guided rounds. In addition, all the fire control software has been developed. The logistical simplicity of using a common Army/Navy projectile is obvious, especially for the US Marine Corps that can use Navy ships as an ammo source. It also becomes practical to park artanks on the decks of Navy amphibious ships where their stabilized mount allows them to contribute to naval gunfire, and could data link with the ship's radar to augment fleet air defense, even while parked ashore. A ground vehicle mounted 127mm gun would be different as it must be a lighter system. Artank battalions would adopt different tactics depending on the threat and mission. For example, one company may set up a defensive position, while the second company acts as an artillery battery with its guns "slaved" to the battery master fire control computer, while the third company sets up for air defense with it's guns slaved to the air defense radar master fire control computer. Artanks that can function as a tank, self-propelled artillery, and a long-range anti-aircraft gun is not a futuristic idea, all the technology exists today.